Guangzhou Tianhe store is located in Tianhe IT have bibcock position, leading the Guangzhou IT development. China Guangzhou IT-CBD last piece of fertile soil -- people's livelihood building, adjacent to the traditional flourishing city Pacific computer market with the Milky Way computer city, the daily average of 100000 people in front of the effective consumption of natural. The forthcoming opening of the subway line three exit location. At the same time adjacent to big, China Normal University and other prestigious schools, connect logistics drainage Whampoa　Avenue, Southern China shinkansen. 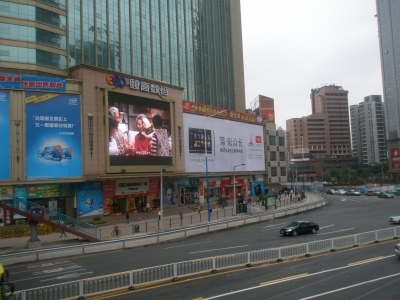 Tianhe Road, Tianhe Road within the radius of 50 meters with more than 100 bus lines construction convenient traffic environment, the ego and the Guangzhou Tianhe store a consumption potential of the corner convenient connection.